Charter Bus Detroit: Amusement Park Trips! Take a Charter Bus to the Amusement Park! Summer is the perfect time to take a vacation, and if you have a youth group or school group, a trip to an amusement park is a great idea. Michigan has plenty of amusement park options, from Jeepers at Lakeside Mall in Sterling Heights to Michigan’s Adventure in Muskegon. You can find roller coasters, water slides, and much more on your vacation, and Ground Travel Specialist (GTS) can get you there on one of our luxurious charter buses! Our buses can handle both overnight and day trips, and our drivers will make sure you are picked up and dropped off on time. If you’re headed to a water park, be sure to pack plenty of towels and sunscreen, as well as a change of clothes. Our luggage compartments have plenty of room, so if you’re taking a group of 30 kids from the local youth center to WildWater Adventure, everyone will be able to bring a suitcase that can be stored underneath the bus, and a personal bag they can store in the overhead compartment in the bus cabin. It’s also a good idea to notify the park that you’re bringing a large group, so they can prepare in advance, and also perhaps plan something special for you and the kids! 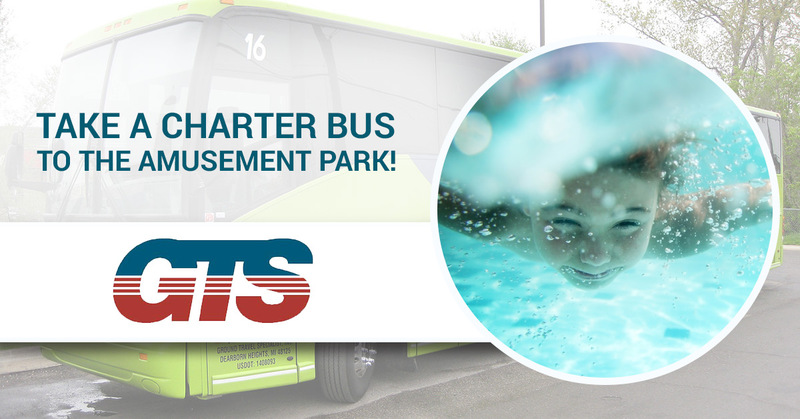 When you’re thinking about taking a group trip to an amusement or water park during the summer, ride in comfort and style with a charter bus from GTS. Every vehicle in our fleet is fully air conditioned, comes with a PA system for announcements, and has a DVD player and multiple screens for in-transit entertainment. Contact us today to book your bus!